Head coach John Duffy has declared himself happy with the shape his Featherstone Rovers team are in ahead of their potential crunch clash with Halifax at the Shay this Sunday. Rovers go into the game off the back of four straight wins and hold a one point advantage over top four rivals Halifax with just four matches left in the regular season. Confidence has been regained in a succession of strong displays against sides in the bottom half of the table as Featherstone have recovered their form following three straight league defeats, including losing a close match with Halifax in the Summer Bash. They did beat ‘Fax at home at the start of the season, however, so will not lack confidence that they can pick up a vital two points on Sunday. The importance of a victory is clear as Halifax could find it difficult to pull back a three-point deficit as they have games still to come against promotion rivals London Broncos and Toulouse. With Rovers also still to play London at home and Toronto away an exciting finish to the regular season looks in store. But they cannot go into the final month in better shape after running up 80 points against Rochdale. ““We spoke about being more ruthless and clinical and with the scoreline we did that,” said Rovers boss Duffy. “There were a couple of shaky moments just after half-time, which we need to nip in the bud, but other than that I think we were excellent. “We wanted to start with a high intensity and get into our groove, make sure we were completing well and playing quick through the middle of the field. We did that and stuck to it. “I’m really pleased with the boys. “We’re in good shape, the boys were great. “We weren’t erratic with the ball or anything like that as teams can be before they go into a big game so I’ve no problems with this game as a preparation. “We’ve spoken about keeping our standards and we did do that – and we played at our intensity. 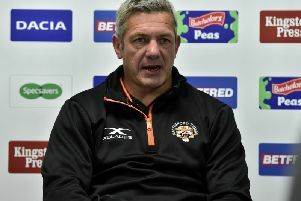 Duffy is hoping to have all the players available from the Rochdale game, although James Lockwood, who bagged a hat-trick of tries, picked up a tight hamstring. Key forward Gareth Hock is likely to be back in the side after he sat out a one match suspension last week.